Microboards' USB Flash Duplicators offer true standalone asynchronous operation regardless of the size of the master content! 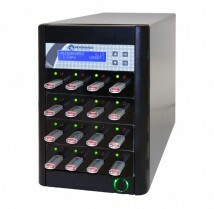 Available in 7 or 15-slot configurations, users can make up to 15 copies at a time in a single system. Making copies with the CopyWriter Flash Duplicator is easy; simply insert your master thumb drive, fill the remaining slots with blank devices, then press the OK button. Asynchronous copying allows users the ability to remove and insert drives at any point during the copying process. Copy USB thumb drives in a flash with the Microboards CopyWriter Flash Duplicators. Available in 7 or 15-slot configurations, users can make up to 15 copies at a time in a single system. Making copies with the CopyWriter Flash Duplicator is easy; simply insert your master thumb drive, fill the remaining slots with blank devices, then press the OK button. Copying commences! - for Serial Numbers beginning with "R"